Publication History: This article was written especially for "Crain's Petrophysical Handbook" by E. R. Crain, P.Eng in 2007. This webpage version is the copyrighted intellectual property of the author. Pyrite is a conductive metallic mineral that may occur in many different sedimentary rocks. It can reduce measured resistivity, thus increasing apparent water saturation. The conductive metallic current path is in parallel with the ionic water conductive path. As a result, a correction to the measured resistivity can be made by solving the parallel resistivity circuit. Although the math is simple, the parameters needed are not well known. The two critical elements are the volume of pyrite and the effective resistivity of pyrite. Pyrite volume can be found from a two or three mineral model, calibrated by thin section point counts or X-ray diffraction data. The resistivity of pyrite varies with the frequency of the logging tool measurement system. Laterologs measure resistivity at less than 100 Hz, induction logs at 20 KHz, and LWD tools at 2 MHz. Higher frequency tools record lower resistivity than low frequency tools for the same concentration of pyrite. The variation in resistivity is caused by the fact that pyrite is a semiconductor, not a metallic conductor. It is nature's original transistor, and formed the main sensing component in early radios. Typical resistivity of pyrite is in the range of 0.1 to 1.0 ohm-m; 0.5 ohm-m seems to work reasonably well. The effect of pyrite is most noticeable when RW is moderately high and less noticeable when RW is very low. It is often instructive to model the effects of pyrite to see what happens to the resistivity and water saturation. The method below is aided by a spreadsheet, shown later on this ppage. Compare these resistivities to the original Ro and Rt to see the effect of pyrite. Compare SwUnCorr and SwCorr to see the effect of pyrite. The corrected resistivity can be plotted versus depth, along with the original log. Corrected water saturation will always be lower or equal to the original Sw.
Rpyr is in the range 0.1 to 1.0 ohm-m, default 0.5. This spreadsheet models the effects of pyrite on resistivity and saturation values. The model can be used to assess the effect of varying pyrite quantity, pyrite resistivity, water resistivity, and porosity. Model Effects of Pyrite on Resistivity and Saturation. 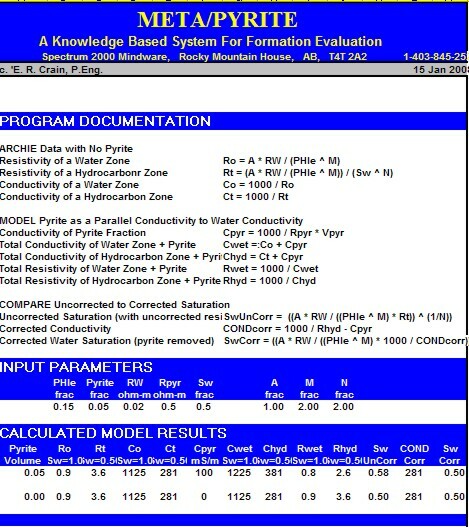 Sample of "META/PYR" Spreadsheet used for modeling the effect of pyrite on resistivity. The analysis models for laminated shaly sands are quite varied and none are perfect solutions. This topic is covered more fully elsewhere in this Handbook The problem lies in how logs average laminations that are thinner than the tool resolution. Most logs average the data in a linear fashion, but resistivity must be averaged as conductivity and then converted back to resistivity. This is the situation with most so-called “low-resistivity” pay zones around the world. The problem exists in laminated shaly sands and in clean sands or carbonates where porosity is laminated. The shale laminations or the low porosity laminations (with high water saturation) have considerably higher conductivity than the cleaner, higher porosity laminations. The net result is a low resistivity reservoir. The chance of by-passing such zones is quite high. The resistivity in this gas zone is only 8 ohm-m. It surprises many people that the average of 4 and 200 is only 8! The contrast with the water zone is low, so many laminated zones are bypassed as not being worthy of completion. In the early days of log analysis, this phenomenon was attributed to many different, almost mystical, reasons because the parallel nature of the conductive paths was not understood by many analysts. In the example above, density neutron crossover shows gas pay in zones with horizontal resistivity of less than 3.0 ohm-m. This crossover is not caused by bad hole conditions or inappropriate density neutron porosity scales. The vertical resistivity shows the effect of the gas, while the horizontal resistivity is dominated by the conductive shale laminations. While gas zones stand out because of gas effect on the density neutron, oil zones will not be so obvious. Pay attention to sample descriptions, oil shows in core or on the mud pit, and the mud log, especially the higher C4+ curves. Water saturation cannot be calculated in the usual way in laminated shaly sands. Sometimes porosity cannot be determined explicitly either. Formation microscanner and acoustic televiewer logs help to obtain a good sand count. 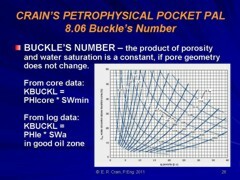 Sand porosity is often determined from core analysis and water saturation calculated from the Buckle's method. Water saturation in fractured reservoirs is a complex issue and has a huge literature. Fractured reservoirs in general are covered elsewhere in this Handbook, where the dual porosity model for fractured reservoirs is covered. This includes a water saturation method that is widely used. The major complication is that a large fracture will be deeply invaded by mud filtrate and will be full of water at logging time, yet be full of oil or gas at static or producing conditions. The host rock will not invade as deeply so the saturation distribution while logging is not as neat or as predictable as in un-fractured rocks. In many situations, a simple approach using the Archie water saturation equation with a low value for M is satisfactory. Use the Pickett plot to determine M from a shallow resistivity log. Careful zonation may be required to isolate heavily fractured from less fractured intervals. If M seems to be too high, then the shallow resistivity is seeing residual hydrocarbons. The variable M approach based on any one of the methods given in previous Sections can also be used. In the Pickett plot shown above, lines for M = 2.0 and M = 1.4 are drawn. It is clear that M varies between about 1.0 and 2.4. M can be calculated for each data point and used in the saturation equation.